With the most powerful BOSCH drive, fully integrated PowerTube battery pack and top-shelf equipment, the AMINGA EVA 3 is ready for an all-terrain workout, excursions in the mountains, or relaxed outdoor cycling. 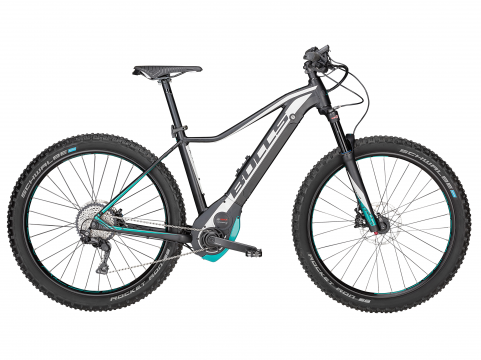 Powerful drive unit assistance, fully integrated battery pack and convincing equipment make the AMINGA EVA 3 an e-mountain bike with superior riding characteristics. Completely integrated the energy needed for plenty of enjoyment while riding is housed right in the down tube. Combined with the steeply mounted BOSCH Performance Line CX motor, a consistent drivetrain is created that not only provides enough power reserves for steep hills and long all-terrain trips, but also ensures an optimal centre of gravity. This guarantees perfect handling and maximum control. Features such as the high-quality hydraulic Magura brake disks or the robust Schwalbe Nobby Nic 27.5+ tyres enhance the AMINGA EVA 3 even further and create maximum confidence and sporty fun - whether you’re going for a workout on the trails, an excursion in the mountains or a laid-back spin in the countryside.